Dedman Graduate Program Applications: What is the Video Essay? As deadlines approach, students around the country are getting ready to submit their graduate school applications. 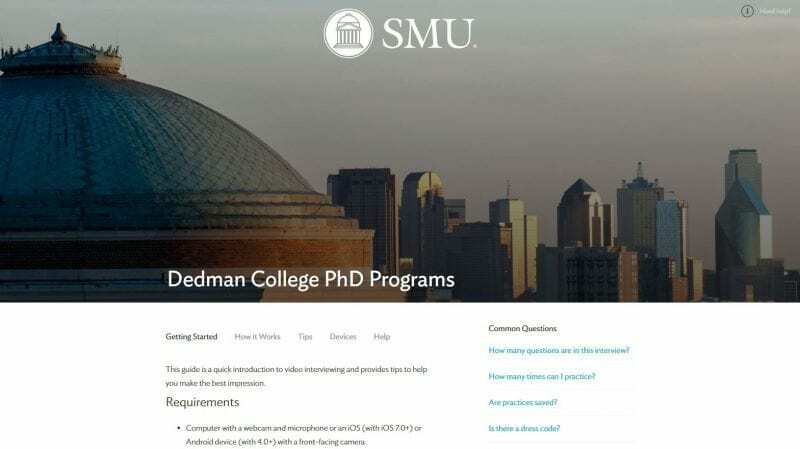 SMU’s graduate programs in Dedman College are doing something new this year as part of our application – including a video essay component. While it might sound intimidating, it’s actually a very informal way of getting to introduce yourself to the entire admissions committee for your department. We’d like to share more about the video essay now to help prepare you as you put together your application. All Ph.D. applicants that: (1) must submit TOEFL or IELTS scores, and (2) have received a TOEFL speaking score below 23, or an IELTS speaking band below 6.5. All international Statistics or Biostatistics graduate applicants, in either the Ph.D. or MASDA programs. For all other applicants, the video essay is optional. What should you expect from the video essay? You will see SMU faculty and administrators asking you about your goals, background, and preparation for your graduate program. After you see the question, you’ll have 60 – 90 seconds to respond in your own video. Because it’s all about you, there is no special steps you need to take before recording. There are no trick questions! However, you won’t have a chance to re-record your response, so make sure you are ready to film. You’ll have an opportunity to film as many practice questions as you’d like before filming the real responses. Many applicants can look the same on paper. We hope that these video essays will give you a chance to express yourself directly to the admissions committee and share why you are interested in your field. And don’t worry, we know that video recordings don’t always go perfectly. Below is an outtake from filming one of our questions, when the wind got a little too aggressive with the equipment. Cresencio Cantu	2018-04-05T09:49:44+00:00	January 11th, 2017|Admissions|Comments Off on Dedman Graduate Program Applications: What is the Video Essay?